Inderpal Grewal’s monograph Transnational America: Feminisms, Diasporas, Neoliberalisms invites its readers to consider the overlapping spheres of postcoloniality, American nationalism and transnationalism, and neoliberalism—and the impact they have on subject formation. Of particular concern for Grewal is the centrality of neoliberal consumerist narratives to anti-racist and feminist social movements. While Grewal points to the widespread diffusion of neoliberal rhetoric, Transnational America is especially interested in “the production of middle-class Asian Indian and American subjects in the 1990s” (Grewal 1). Grewal considers a wide variety of case studies, effectively making the case for the widespread transmission of a transnational America: Transnational America takes as its archive fiction in English by Indian-American authors, Mattel’s “Indian” Barbie, migrants of various classes and female asylum seekers. In some ways, then, there is something in Transnational America for everyone. The varied nature of her archive gestures to Grewal’s multi-valent focus and wide-ranging theoretical approach; “it was only by combining a postcolonial perspective with textual literary analysis, social and cultural theory, and feminist and ethnic studies approaches that I could begin to engage with the questions in which I was interested” (Grewal 33). Transnational America provides a useful model of what Grewal and Caren Kaplan term “transnational feminist cultural studies” (Kaplan and Grewal 67) but also, more broadly, the transnationally-inflected scholarly work that many in the humanities and social sciences are now undertaking. She points to the way the cultural work done in a variety of different formats and genres all gesture to a similar set of questions about what it means to be human and, more specifically, American. Instead of positing the work done by novels or by Barbie as inherently less serious or rigorous than that done by non-profit groups, Grewal demonstrates their complex interaction across disciplinary boundaries—allowing for the different kinds of work done in different spaces but which, nonetheless, all intervene in subject formation. While Grewal’s work here points to the overlapping questions that arise in myriad different cultural forms and locations, it also echoes the fluid notion of “America” at work in Transnational America. This fluid notion of “America” is one of the book’s biggest strengths as Grewal differentiates between the United States as a particular geo-political entity and America as an imagined community that is both national and international. While Grewal’s terminology is slippery at times, it helpfully points to a distinction at work throughout: the differing impacts of a state and a nation. Thus while the United States is clearly a central figure in Transnational America, Grewal is particularly interested in the imaginative work that America-as-nation performs both at home and abroad (also noting that America as imagined community is roughly contiguous with neoliberalism). Through this differentiation between the United States and America, Grewal allows for a more nuanced consideration of the way both interact globally—suggesting, for instance, the way the United States as a geo-political unit might have vocal critics throughout the world, while America retains its allure of fantasy: “many in the United States and outside … mourn its perpetration of violence and feel a solidarity with it that they would not feel for most other countries around the world” (Grewal 220; emphasis added). While this is perhaps not a new revelation, Grewal marshalls this observation in a useful way as it reveals much about how actually-existing transnationalism—this prominent theoretical buzzword—operates. However, Grewal’s focus on America as the discourse through which this particular model of transnationalism is articulated points to the limits of transnationalism as a broader theoretical paradigm. Is transnationalism primarily (even exclusively) synonymous with America-as-imagined-community? While this question is mostly implicit in Transnational America, this question has been raised more explicitly elsewhere by others. For instance, Timothy Brennan, in At Home in the World: Cosmopolitanism Now, asks whether “cosmopolitanism is the way in which a kind of American patriotism is today being expressed” (26). 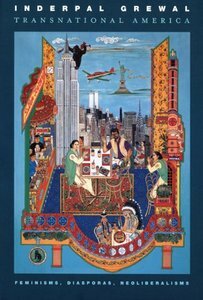 While Grewal explicitly addresses the limits she’s placed on her study—stating her focus on middle-class Asian Indian and American subjects in the 1990s on the first page, we must continue to query whether transnationalism is primarily to be used in reference to discourses surrounding the U.S. Indeed, it would be helpful to have Grewal address this more explicitly. Is her focus on transnational America a result of her archive, or does it reflect something central to transnationalism? Both are reasonable arguments (though the second option is worrying, given the academy’s recent turn to transnational studies), but these particular stakes remain implicit throughout the text. Similarly, Grewal’s suggestion that America is coterminous with neoliberalism introduces another term into the definition of transnationalism. In other words, is transnationalism necessarily a by-product of neoliberalism? As Grewal usefully points out, the rhetoric of neoliberalism is one that has been taken up by a variety of groups, including some that are on the surface critical of neoliberal policies. For instance, she makes the important argument that “the concept of ‘choice’ as a central ethical framework for feminist as well as neoliberal consumer practices [has led to the] imbrication of feminism with consumer culture” (3). Grewal traces, through an examination of the transformation of women’s rights into human rights, and the gendering of refugees, the way that neoliberal rhetoric and actions get taken up transnationally. She argues that “human rights discourses evolved at the end of the twentieth century as an ethic of neoliberal governance that produced subjects who saw themselves as ‘global citizens’ and ‘global feminists’” (158). Grewal asks difficult—and often disconcerting—questions about social movements, demanding that her readers approach no social movement as above scrutiny. For Grewal, this emphasis on a neoliberal model that privileges “choice” above all else overlaps with transnational projects that similarly emphasize commonality: “discourses of rescue erased histories of various economic, state, political, and cultural formations and human rights, as an ethical regime replaced historically contextualized analyses of women’s lives” (153). So while choice remains central, the limits placed on choice are made invisible. If, as Grewal states in the introduction, “this book is about the 1990s, when a new phase of neoliberalism brought together market logics with concerns for reducing welfare and poverty, and in the process rearticulated feminist and postcolonial subjects out of longer colonial histories and epistemologies” (15), it is also a book concerned with the way the turn to transnationalism has similarly rearticulated subjects out of histories and epistemologies. Grewal does not cite Sara Ahmed’s Strange Encounters: Embodied Others in Post-Coloniality—a text which would be helpful to have in conversation with Grewal’s with its discussion of the way, what Ahmed terms, “stranger fetishism” “invests the figure of the stranger with a life of its own insofar as it cuts ‘the stranger’ off from the histories of its determination,” suggesting the importance of revealing “the social relationships (involving both fantasy and materiality) that are concealed in stranger fetishism” (5; emphasis in original). Both texts suggest the ways that discourses of transnationalism work to de-historicize the subaltern—frequently the subaltern woman—though in different locales, pointing to an overlapping theoretical conversation. within the networks of information linked to trade and consumer culture, cosmopolitans were produced by transnational connectivities within which particular knowledges about cultures and nations circulated. As such, divisions based on gender, race, class, caste, religion, and ethnicity were rearticulated within varied transnational connectivities” (79). Emily Johansen is an assistant professor in the Department of English at Texas A&M University. Her research considers contemporary British and postcolonial fiction, and cosmopolitan theory. She is particularly interested in how contemporary fiction imagines forms of cosmopolitanism attentive to questions of place and political responsibility. She has recent articles in Canadian Literature, Postcolonial Text and Politics and Culture.